Stasya, the season has ended a little earlier for you than for the rest. What do you feel waiting for the next one? – The season turned out quite strange for me. I used to get very tired before the last competitions, but this time I was haunted by such a strange feeling, as if I hadn’t done something. Have you got any new knowledge in terms of attitude to work this season? – No, most likely, I have not discovered anything new in this regard. Just, once again made sure how hard you need to work, how clearly you needed to focus on things that are important at the moment, here and now. And that you should not be distracted on other problems that distract you from the most important thing. When will you heal ankle injury? Almost all this season we saw you with tapes on your left foot. – I have not thought about the treatment yet, I will skate for a month, jump, will give myself loads to be in good shape. – The peak of injury was in January – at the European Championship. We then did a medical survey, but I could not stop trainings. But this is a big risk! – All this is not so critical – it is tolerable, it is recoverable. Yes, the situation is not the easiest, but in general it is possible to live and work with it. Soon I will heal all this and by the end of May I will continue to work. At what stage are new programs? – We are working on them. I want to properly improve in skills during the offseason, and for this I need to work hard. I have no right to stand still, and certainly not going to give up my positions. We have already done a short program – to the music of the Petersburg composer Leonid Levashkevich “February”. We also decided about the free program, the music is from the movie “Moulin Rouge”. But for now everything else is a small secret. Do you plan to complicate programs? – Most likely, the free one. I think that I will move some difficult elements to the second half. What about triple axel? There is a video, where you are doing it on harness. – I really train it a lot on the harness. Everything works well, but you need to work a lot without it. Does it turn out without a harness? – While I’m falling, I don’t feel the entrance to the end. Triple Axel is a difficult jump, treacherous. You can’t overcome it just by force. It’s not enough just to push harder. Technique. But it’s ok, everything should work out, but I don’t want to talk about this jump in vain, a day will be and food will be. Did problems of height and weight bring you inconvenience this season? – The fight with weight, or rather the work on keeping it lasted the entire season. It was hard for me – I had to do enormous efforts every day. I hope to normalize it in the offseason, so that in the next season I wouldn’t spend so much emotional and physical strength. Looking at you, it’s hard to imagine that you can have such problems. – I have a predisposition to weight gain, but for me this is not a big problem now – I have been prepared for this since childhood. My whole family eats healthy. When you have heavy loads, you can’t limit yourself very much in the diet. Therefore, I spent every evening on the treadmill at least an hour. So now I really want not just to keep fit for the next season. I want to change somehow in order not to spend so much energy on fighting with weight. A year ago, in the offseason, the athletes of your group went to a two-week training camp in the United States to Rafael Arutyunyan. Do you plan to repeat this experience? – I really liked it then, I really learned a lot of important and useful things for myself working with him. Personally, I would be very interested to go there again, it was a great experience. At the end of this season, do you still love figure skating? – You know, once I considered myself just a “skater”, and now I understand a very important thing – I adore figure skating. I did not stop loving it. Yes, in figure skating there are things that are really hard to love. But there are much more such things that worthy of loyalty to this sport. 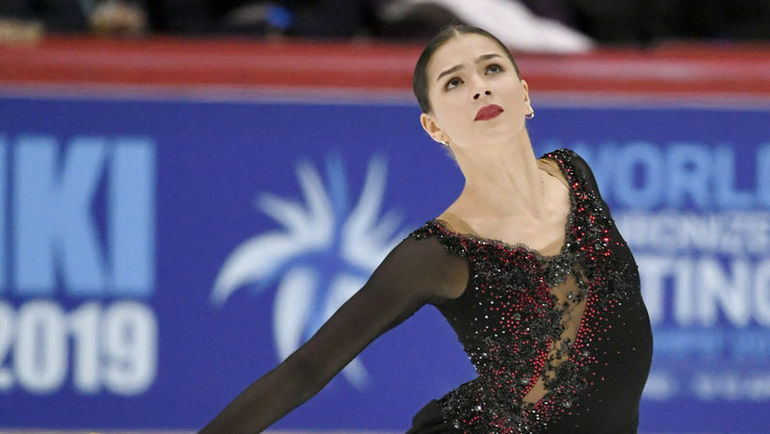 Can’t wait to see her new programs!